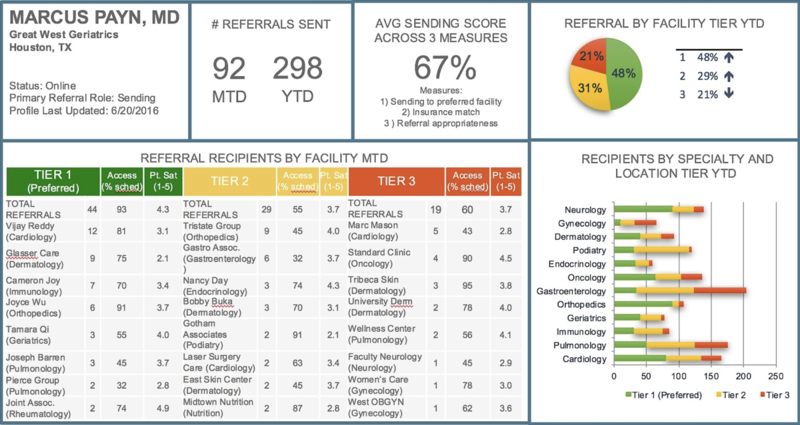 par8o offers a comprehensive suite of referral management technologies to connect and empower provider networks. Bring visibility to provider affiliations across a network at the point of the referral. Capture 340B savings from prescriptions resulting from referrals. Coordinate care across multiple practice groups and EMRs. 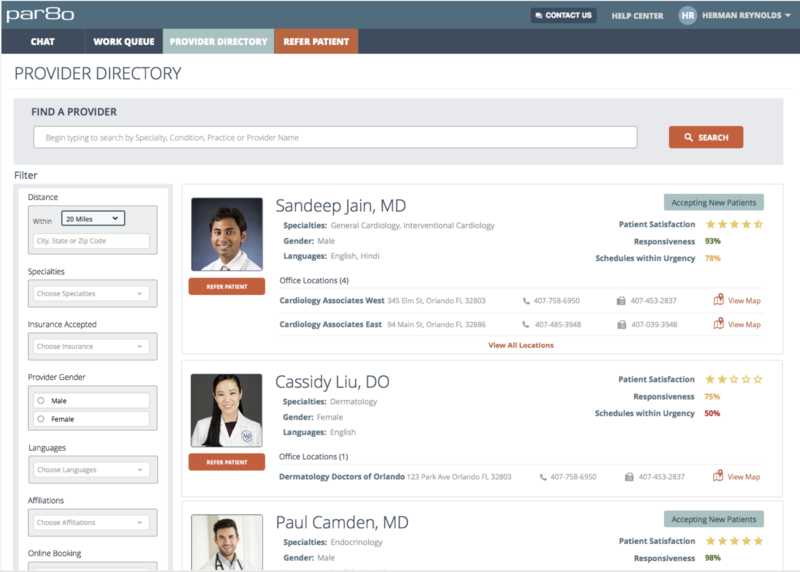 Centralize inbound referrals and find the right provider for patients. Learn why our software is used to refer thousands of patients every day by institutions such as Dignity Health, Adventist, Mount Sinai Health System, and more. par8o helps primary care providers and specialists refer patients to in-network providers based on your preferred networks, insurance acceptance, proximity, and more. Our referral management system can also vary navigation based on payer and plan. With enterprise-level reporting, par8o empowers healthcare systems to hold providers and staff accountable for getting patients seen when needed, allowing organizations to manage downstream spend and take on risk. Our 'Care Compass' recommends referred-to providers for each referral based on clinical urgency and scheduling availability, ensuring that patients are seen when needed it by providers who meet their clinical needs. Better care coordination and real-time referral statuses mean patients are never lost to follow up after a referral has been made. Plus, automated patient texting makes it as likely as possible that patients attend their appointment. Our solution is designed to optimize the referral process and care transition for every patient, including patient access to care, care coordination and interoffice communication. We're an ideal solution for a variety of healthcare systems, from large healthcare systems to ACOs and CINs with both employed and independent offices. par8o's Care Compass creates a personalized list of recommended providers for each patient based on your preferred network, provider insurance acceptance, office proximity, patient satisfaction scores, office responsiveness, and more. Managing referrals often requires human conversation. Phone calls mean phone directories, hold times, voicemails and phone tag, and faxing can be unreliable. 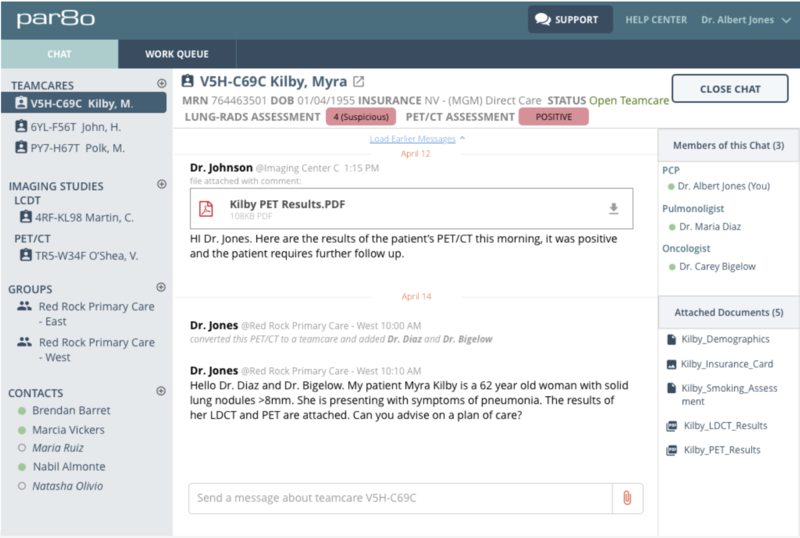 HIPAA-compliant par8o Chat helps offices coordinate care instantly, supports multi-tasking and allows staff to exchange updated patient phone numbers, prior auth status and patient files. par8o integrates with your network’s primary EMR via HL7 feed for a seamless workflow for PCPs. And par8o is EMR agnostic, so employed and independent offices can work together. See your referral pattern data in real-time through integrations with tools like Tableau, download raw data for your data warehouse or use our in-app reports. Use this data to unlock patient access and analyze network office performance . 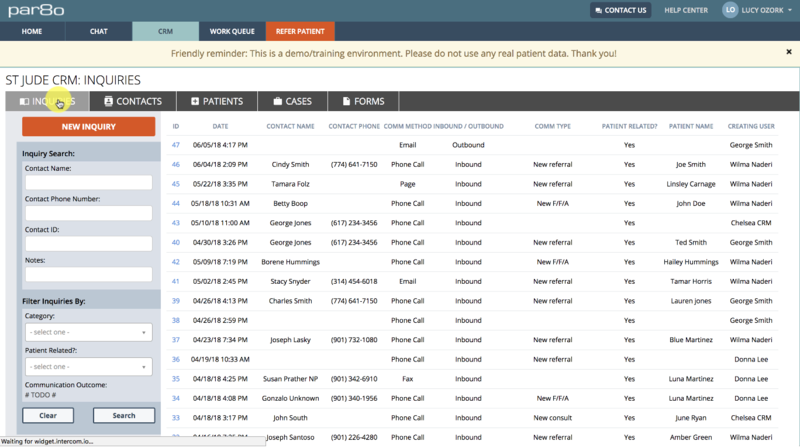 Log email and phone interactions, link patients to providers, add attachments, create referrals, and more. Already using Salesforce? We integrate with that, too. We take your network data sources, merge them, deduplicate them, and create a searchable, single source of truth. Plus, our unique staff engagement techniques keep your data up-to-date in an unprecedented manner. Patients experience a seamless care transition and providers see increased appointment attendance with automated, friendly appointment reminders by text message. 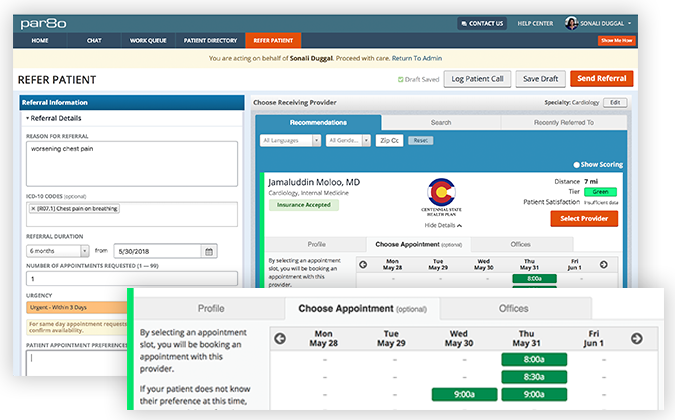 With Direct Scheduling, sending staff can schedule referral appointments with patients during referral creation, increasing the likelihood that patients attend specialty appointments leading to better patient care and better outcomes. Here you'll find our latest news, blog posts, case studies, webinars & more. AdventHealth, one of the nation’s largest faith-based health care systems, selected par8o to enhance care coordination and the patient experience through more effective referral management across the health system. As developed over 7 years of experience and over 1M referrals across a range of providers, payers, and self-insured employers. Learn from par8o about navigating the murky waters of 340B compliance and prescriptions resulting from referrals in "340B Lessons from the Field - Including Referral Prescriptions In Your 340B Program: What It Takes To Be Compliant". This session was presented at the Winter 340B Coalition and is now available on-demand. A select set of health system and provider network clients that have deployed par8o enterprise-wide. ©2018 par8o, Inc. All Rights Reserved.